Forum Scarlet-Clicks → Scarlet-clicks → Rented referral Strategy → What is the optimal AVG? What is the optimal AVG? Hello, what is the optimal AVG? When to replace RR? For 69 clicks AVG is only 2.2, recycle? just recycle ,don't give them more days to waste! My opinion: don't recycle without knowing why. You need to know why you must recycle or not. AVG is good or bad according one specific thing: your expenses. - That he clicks ONLY one ad per day. - And that his click brings you a whole dollar profit. (OK, this is too much but let's avoid the too many zeros in our example). Now, if you invested here 1 dollar what do you thing about his AVG? Is it good or bad? Well, it's not just good: it's PERFECT! Because you'll earn back your investment in one single day! Now let's assume that his click does NOT give you a whole dollar profit but only half of it. Is this a good AVG or not? Well, it's is very good but not perfect since you need two days to take your investment back. Now think: what if his click has even smaller value e.g only 0,25? Or 0,1? Or 0,001? Or 0,0001? Do you see the difference? You'll need a lot of days to take your investment back. So, less profit = more days. Of course you probably thinking right now "but this is common sense, i.e less profit = more days! Why are you telling me this"? Well, the answer is simple: "more days" based on what? YOUR EXPENSES. This is how you calculate AVG. Based on your expenses. You don't need site's calculator because the calculator calculates only your profits, not your expenses. It's useless to you. You need to know your expenses. It's mandatory if you want to know your profits. PS: Since you didn't tell us how much you invested here (if you invested yet) we can't be sure if this is a good or bad AVG for you. Generally though it is considered good. Now you know why you must recycle or not. I invested 190$, now I have 860RR. Did I calculate it well? that is if you don't renew you RR for a longer time periode ( 60days, 90 days etc). 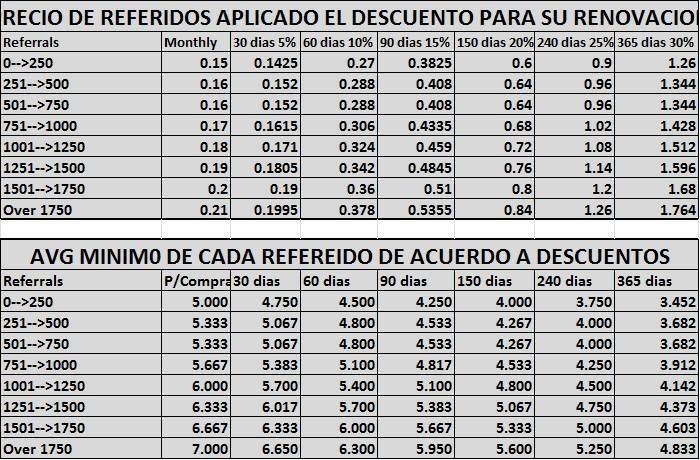 if you renew your RR then your BEP(need AVG to brake even) goes down. Help me, please ... I have 1140 references and they clicked 5680 times. Is it good or bad? I have not been able to identify whether it is good or bad.